James McClean faces questions from Sunderland boss Martin O'Neill over his Twitter outburst following the Republic of Ireland's victory over Kazakhstan. 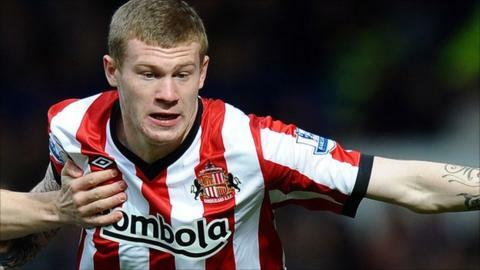 McClean was left on the bench for the 2-1 win and later tweeted to describe his lack of action as a "joke". The winger had to apologise to Republic boss Giovanni Trapattoni and the Irish players after the episode. "He has a bit of a problem (with Twitter) and we will have to rectify it," said the Sunderland manager. McClean's tweet after the World Cup qualifier also included an expletive. In his apology a day later, McClean acknowledged that he had been "stupid and disrespectful". Striker Kevin Doyle also revealed that the Republic's senior players had told the 23-year-old that his behaviour had been "unacceptable". O'Neill added: "He has even admitted himself he has been rather foolish. "He has taken himself off Twitter. Apparently he might have a situation with Facebook as well and about 14 other accounts that he has." O'Neill said McClean, a former Derry City player, was aware of club rules regarding the use of social media. "They were read to him, they were given to him, he was there that day," said O'Neill. "Not only that, some of his language was pretty poor and we will have to deal with that." O'Neill also said McClean had been acting "rather strangely" and added that he should leave Trapattoni to pick the Republic team. "It's good when the player not only wants to play, but he also wants to manage the team as well," said O'Neill. "James is rather young for that at the moment. I think Mr Trapattoni has got a couple of years on him and a couple of titles, too, so I think he's entitled to pick the team."